John Staples Harriott, was a British army officer who while stationed in India, at the service of the East India Company, came to acquire the Jami' al-tawarikh in its original manuscript. 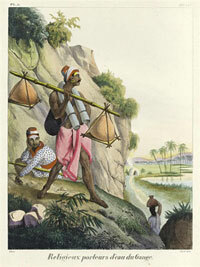 He lived much of his life in Calcutta, India employed by the East India Company. While in the service of the East India Company, he ultimately reached the rank of Major General. He is most famous for being one of the owners of the key manuscript of the Jami' al-tawarikh. The Jami' al-tawarikh was the most important medieval manuscript dealing with Mongol history. Main works: On Pauperism and the Poor laws (London 1821); Observations on the oriental origins of the Romnichal, or tribe miscalled Gypsey and Bohemian (London 1830); Mémoire sur le Kabir Pantis, secte de Déistes de l'Hindoustan (Paris 1832); Napoléon : drame politique et historique en cinq actes, a l'imitation de Macbeth, de Shakespeare (Paris 1834). Catalogue de livres et manuscrits orientaux, provenant de la bibliothèque de feu M. John Staples Harriot,... rédigé par MM. Mohl et Paul Lacroix, avec des notes de MM. Eugène Burnouf et Garcin de Tassy, Paris, Administration de l'“Alliance des arts”, 1843, in-8°, 32 p.